That’s a photo that a mob of you lobsters sent me. You lobsters, meaning… the readers of this site. If you don’t know what I’m talking about… welcome… read it here. Lobshots readers = Lobsters. I love the lobster industry, and these AP writers, just fumbling and bumbling over themselves trying to explain the emergence of these rare lobsters. News flash… you have Lobshots to thank. You think it’s a coincidence that the emergence of the rare, colorful, wonderful lobsters coincides perfectly with the inception of Lobshots? There are no coincidences, my friends. PORTLAND, Maine (AP) — When a 100-pound shipment of lobsters arrived at Bill Sarro’s seafood shop and restaurant last month, it contained a surprise — six orange crustaceans that have been said to be a 1-in-10-million oddity. 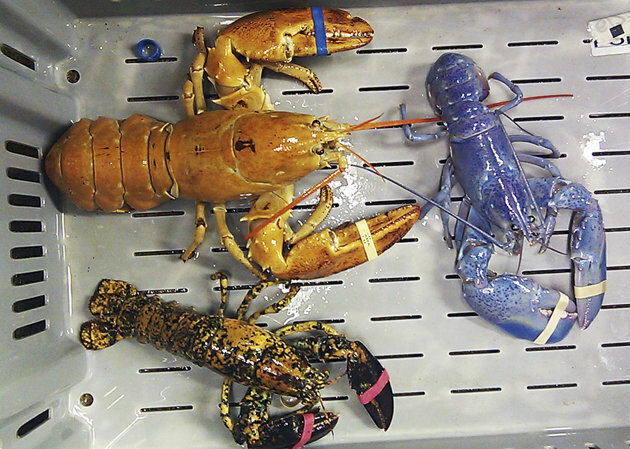 Reports of odd-colored lobsters used to be rare in the lobster fishing grounds of New England and Atlantic Canada. Normal lobsters are a mottled greenish-brown. But in recent years, accounts of bright blue, orange, yellow, calico, white and even split lobsters — one color on one side, another on the other — have jumped. It’s now common to hear several stories a month of a lobsterman bringing one of the quirky crustaceans to shore. It’s anybody’s guess why more oddities are popping up in lobster traps, said Michael Tlusty, research director at the New England Aquarium in Boston. It could be simply because advances in technology — cellphone cameras and social media — make it easier to spread the word about bizarre lobster sightings. It’s also likely more weird lobsters are being caught because the overall harvest has soared. In Maine, the catch has grown fourfold in the past 20 years, to nearly 105 million pounds last year. If the yield has quadrupled, it would make sense to have four times as many unconventional lobsters being caught as well. Although lobster is the No. 1 commercial fishery in the Northeast, there are a lot of unanswered questions about the bottom-dwelling creatures, he said. “Are we seeing more because the Twitter sphere is active and people get excited about colorful lobsters?” Tlusty said. “Is it because we’re actually seeing an upswing in them? Is it just that we’re catching more lobsters so we have the opportunity to see more? Lobsters come in a variety of colors because of genetic variations. It’s been written that the odds of catching a blue lobster are 1-in-2 million, while orange comes in at 1-in-10 million. Yellow and orange-and-black calico lobsters have been pegged at 1-in-30 million, split-colored varieties at 1-in-50 million, and white — the rarest of all — at 1-in-100 million. But those are merely guesses, and nobody knows for sure. What is known is that colored lobsters have shown up in greater frequency in certain areas over the years. The waters off Cutler in eastern Maine were once a hotbed for blue ones, after 1,500 larvae-sized blue lobsters were released in 1990 to use as a tracking tool to determine their survival rates, said Bob Bayer, executive director of the University of Maine’s Lobster Institute. The waters off Montauk, N.Y., once had a lot of blue lobsters as well, he said, after researchers released large numbers of blue lobsters there. The bright-orange lobsters that were in Sarro’s shipment are believed to have come from the same waters in Canada. Aside from their color, the lobsters are apparently normal in all other ways, Bayer said. They all turn red when they’re cooked, except for the white ones since they don’t have any pigment, and diners wouldn’t notice a difference. “There’s no difference in taste,” he said. Scientists say it’s possible the lobster population as a whole has a greater percentage of misfits than it did in years past. The off-colored lobsters are more susceptible to predators because they stick out more on the ocean bottom, rather than blending in like normal ones, said Diane Cowan, executive director of The Lobster Conservancy in Friendship, Maine. “But with the predator population down, notably cod, there might be greater survival rates among these color morphs that are visually easier to pick out,” she said. Lobstermen have brought Cowan countless colorful lobsters over the years. The prettiest one, she said, was pink and purple. This entry was posted in News and tagged LobShots, lobshots signs, lobster signs, lobsters, rare lobsters. Bookmark the permalink.